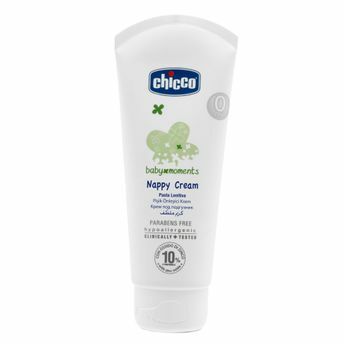 Specially formulated to protect your baby's delicate skin and prevent diaper rashes and inflammation, the Chicco Baby Nappy Cream is just what you were looking for. This gentle nappy rash cream can be used daily to moisturise your child's skin at every diaper change, after a bath or whenever needed. Being a clinically-tested product, it can be used safely on sensitive skin to keep it soft and smooth. Being free from parabens, dyes and alcohol, it is safe even for your newborn. Hypoallergenic in nature, Chicco nappy cream will not cause any skin allergies or irritation. Its zinc oxide-based formula helps in forming a breathable protective barrier on the skin. It thus shields your baby's delicate skin from nappy rash and other skin irritations. This cream also contains panthenol that helps in rejuvenating your baby's dry skin.